Eveline Heitzman was born on August 22, 1941 in Velten / Berlin, Germany to Hugo and Elfriede (Seidel) Schoefer. She died April 3, 2019 in Petersburg, VA, at her daughters home. She graduated in 1954 and attended college for four years. After schooling, she worked as a conductor on the Siberian Express till she left East Germany in 1958. Eve married Robert M. Heitzman on December 29th and 30th 1961 in Vilseck, Germany. He preceded her in death on December 1, 2008. During their marriage, they moved often due to Robert’s service in the military. On July 4, 1978, they made their final home in Sparta, WI. Eve started working at Rolling Hills until 1985 and started her own travel agent business. She and her husband also owned BH Catering. After retirement, she worked part time for Sparta Tourism and Kwik Trip. Eve enjoyed bowling, golfing, and was very active in the community as a volunteer. 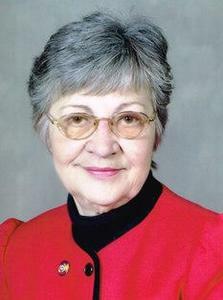 She was a member of the PCCW, founding member of Sparta Butterfest, and Sparta American Legion Auxiliary serving as President, Vice President, and Secretary. In 1990, Bob and Eve started the Community Christmas Dinner. Eve is survived by her daughter, Sylvia (James) Thomas of Petersburg, VA; four grandchildren, Natasha, Marquita, Ricky Jr., and Jennifer; nine great grandchildren; one great great granddaughter; an uncle, Alfred (Anna) Hanel of Nuernberg, Germany; and nephews, nieces, and special friend, Ricky (Rebecca) Smith. She was preceded in death by her husband, Bob Heitzman; her parents; and a sister, Ingeborg Guenther. The Lanham-Schanhofer Funeral Home, Sparta, WI, and Heritage Lifestory Story Funeral Home, Grand Rapids, MI are assisting the family with funeral arrangements.